floatingsheep: The Twelve Posts of Santa, Part III: A new Holy Roman Emperor? The Twelve Posts of Santa, Part III: A new Holy Roman Emperor? Now that we've explained the thinking behind this year's Search for Santa (in Part I) and mapped out references to two of the most popular names for that old bearded guy (in Part II), we thought we'd begin expanding our analysis to the plethora of terms we searched for. The second map in our series, presented here, continues to analyze English-language terms, this time including the names "Saint Nicholas", "Santy" and "Kris Kringle", but with a broader focus on the European continent rather than just the UK. What we can see is that while Father Christmas seems to be focused on England, Santa Claus really gets around. His name has been inscribed on the virtual landscape all the way from Portugal to central Russia. Unlike other more ethnolinguistically specific terms for Santa, "Santa Claus" appears to be incredibly prevalent no matter where one might be. But most interestingly, the area with the highest concentration of references to Santa closely corresponds to the old Holy Roman Empire. Coincidence? We think not. Consider the following hypothetical word morphology. Clearly there is a connection. Note also that Santa Claus reigns supreme at world's most christmassy point: Kittilä, Finland. While Santa Claus seems to be the primary term across most of Europe, it's also possible to notice the not insignificant number of points where references to "Saint Nicholas" predominate, perhaps indicating the greater cultural importance of Saint Nicholas' Day on December 6 in some regions. 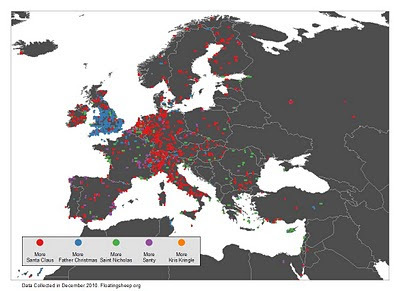 And though Santy is something of an Irish name for the old guy, references to "Santy" seem more prevalent at scattered points around France and Spain, while "Kris Kringle" is all but absent from the European Yule-tide cyberscape. This series is terrific fun. I've been writing a phony balony Santa/geopolitics followup post and look forward to referencing this stuff, somehow. You should differentiate between the christian bishop "Saint Nicolaus of Kyra" (German: "Sankt Nikolaus") and the christmas attributed "Santa Claus, Father Christmas" (German: "Weihnachtsmann", literally translated "Holynightman"), who brings the gifts to the children, and isn´t identical with Saint Nicolaus in German. Also in Russia and eastern europe there is a third variant called "Father Frost/Freeze" (German: "Väterchen Frost"). The dates of the fests are: 6th Dezember for "Saint Nicolaus", 24th Dezember for "Santa Claus = Weihnachtsmann" and 1st January or winter-time for "Father Frost". These are three different figures with different tasks.